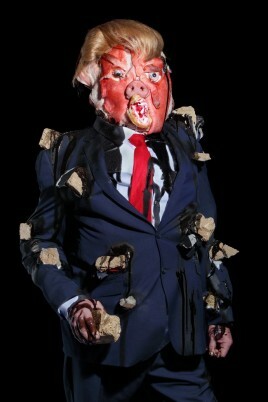 Although the ‘Bindu Shards’ (2010) installation sadly is completely booked out and the Gagosian Gallery at present has no plans for extending this amazing exhibition, please don’t be put off. It will still make your day, week, month, especially in these dark winter days. 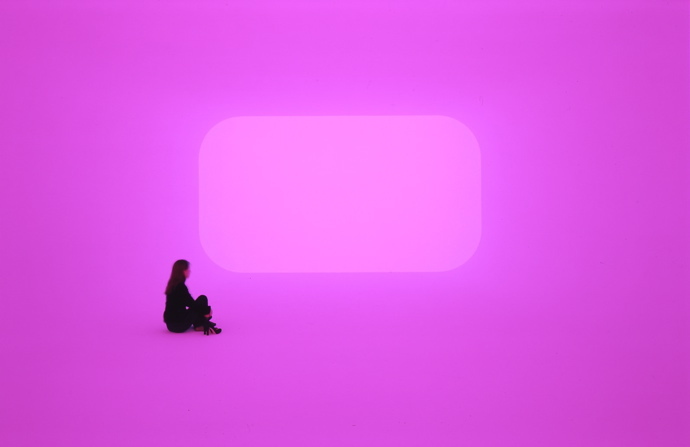 James Turrell’s explorations of the myriad possibilities of using light as a medium of perception is legendary. 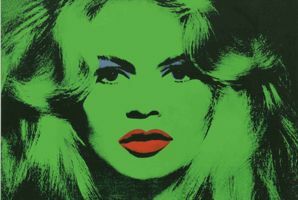 Although initially seemingly simple, his works draw attention to the limits of seeing while seeking to expand the wordless thought that they provoke. The imageless and formless landscape of ‘Dhatu’ (2010) yields an emptiness filled with light that allows the viewer to feel its physicality. Light like this is seen rarely with the eyes open, yet it is familiar to that which can be apprehended with the eyes closed in lucid dream, deep meditation, and near-death experiences. Despite the images shown here, depicting the model wearing shoes, in reality you’re asked to remove yours and put protective plastic bags on, adding to the eerie feeling that you’re shuffling towards your final destination. The sensation of being bathed in the various hues is incredible and very emotional, yet simultaneously you feel quite numb. 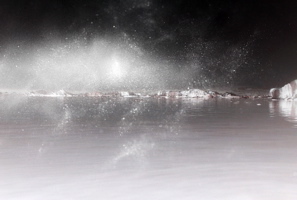 The relation of exterior light to interior light is explored further in the work ‘Bindu Shards’ (2010), a fully immersive visual and auditory work to be experienced by one person at a time. Yes, the ‘lab assistants’ really do look like that. And no, you haven’t a chance of trying it, there’s a long list of very lucky people who got there before you. Just accept it. 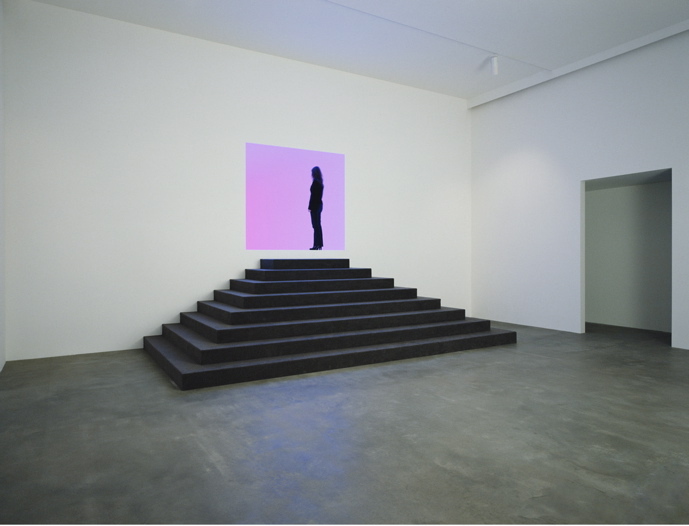 Turrell’s holographic works further blur the theoretical properties of light by creating the illusion of tangibility. 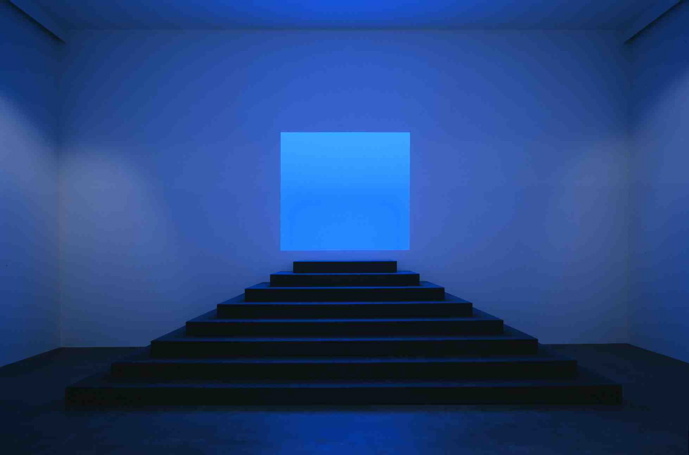 In a series of holographic works – two reflective and two transmissive – planes of light are manipulated in the same manner as the earliest ‘Projection’ series from the 1960s where light first became Turrell’s primary medium. These works are in a small room to the right just as you enter the Gagosian, be sure to ask as it isn’t obvious that they are there. 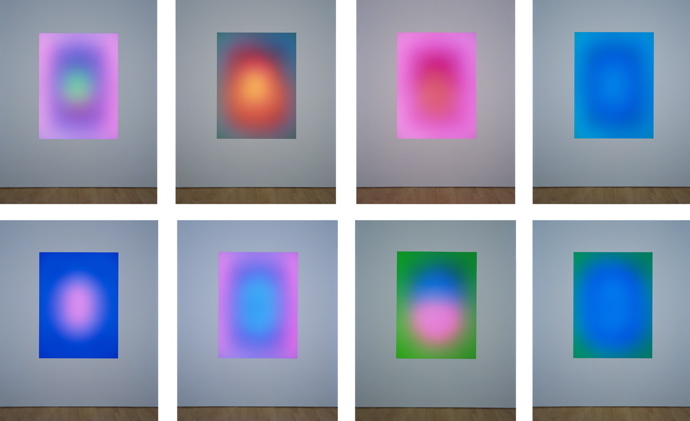 ‘Sustaining Light’ (2007) is equally mesmerizing, at times making you think your eyes are fooling you into seeing changes that aren’t happening really then literally bathing your eyeballs in colour. It lasts for 3 hours without repeating itself. Wondrous.